If you’ve read this blog for any length of time, you know that SMS messaging has worthwhile applications for all sorts of businesses. Real estate and education, construction and banking have all found valuable niches where a well-timed, properly worded text can spin the proverbial straw into gold. Even nonprofits have put SMS into play with their various charitable campaigns. A finely tuned SMS campaign distills marketing down to its most potent form, forcing companies and promoters alike to consider what exactly are the true essentials of a particular business. No wonder SMS is such an effective tool. So here’s a question: Why aren’t more retailers using it? In an August 11, 2016, article on BizReport, Helen Leggatt lamented that SMS is “the least-used of all communications channels” for retailers. Citing a recent study by OpenMarket, she notes how virtually all retailers employ email, eight out of 10 make use of social media, two-thirds keep the old-fashioned phone in play, and roughly one-third use mobile apps. But only a measly 29 percent bother with SMS. But it’s an entirely different matter when it comes to smaller retailers. About one in five didn’t think SMS would mesh well with their current businesses, while 16.9 percent simply hadn’t familiarized themselves with the first thing about text-based communications. An even smaller number (15.5 percent) was currently trying to find the right SMS vendor with which to implement a program or campaign. A majority (62 percent) even said that they would willingly try SMS services if someone could clearly communicate to them how it would boost revenue or aid customers. But the real reason why so many small-to-medium-sized retailers hadn’t given the nod to SMS was distressingly simple: While over half (52.1 percent) believed that it could help their businesses, they simply hadn’t taken the time to make it a priority. Such a response surprised Emmet. “Mobile maturity is still in its very early stage for a lot of retailers,” he explains. “They don’t fully grasp its value because, in part, they don’t understand its ROI. The reality is that 90 percent of SMS messages are opened within about 90 seconds.” More than that, though, SMS boasts unprecedented reach, allows for easy feedback, and makes it a snap to inform customers about promotional events, all of which I’ve discussed before. 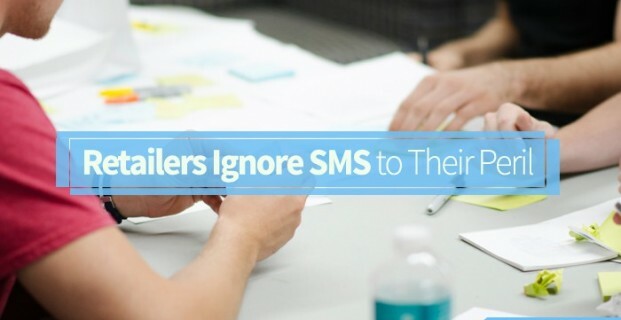 In the end, the message is plain: Retailers of all sizes ignore SMS to their own peril.